This application note discusses the use of precomputed directional visibility, along with environment maps, for fast interactive lighting and re-lighting of complex scenes. Both the directional visibility at each point and the illumination from an environment map are represented as spherical harmonics. This makes the computation of the environment illumination of the scene a simple dot product of the two sets of spherical harmonic coefficients, which is fast enough to be interactive. This functionality is new for PRMan version 16.0. 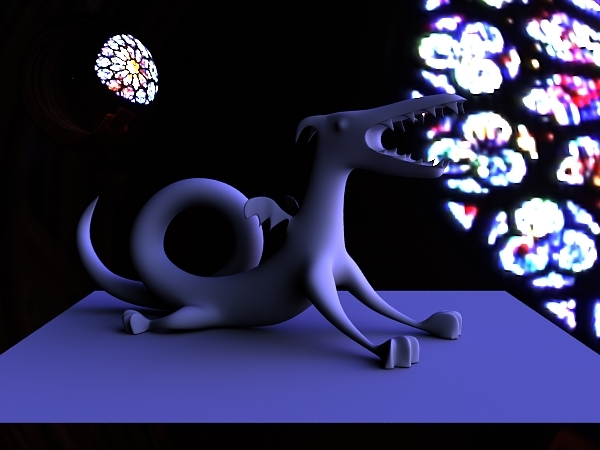 The directional visibility at each shading point in the scene can be computed once and for all using either the ptfilter stand-alone program, or the RenderMan Shading Language occlusion() function. For more details about this step, please see the PRMan application note Point-based approximate ambient occlusion and color bleeding. The directional visibility from a point is basically a function defined over the hemisphere. The function values are 0 and 1. We can approximate this function using spherical harmonic basis functions. In this step, we'll compute the coefficients of the spherical harmonic representation using ptfilter. The computation is very similar to the computation of ambient occlusion, but instead of computing just a single float number (the average occlusion at that point), we compute an array of floats: the spherical harmonic coefficients for the directional visibility. The resulting point cloud, dragon_dirvis3.ptc, has an array of float data called _dirvisshcoeffs. The name is short for "directional visibility spherical harmonic coefficients". The values of the array can be inspected with the ptviewer interactive viewing program. The number of elements in the array (the number of spherical harmonic coefficients) is the square of the number of bands. As an alternative to ptfilter, the occlusion() function can also be used to compute the directional visibility spherical harmonic coefficients. The occlusion function has a new optional parameter "shbands" (default value: 0) and a new optional output parameter "dirvisshcoeffs" (an array of float values with shbands squared elements). If the coeffiecients are computed this way, they should be written out to a point cloud file in preparation for the next steps. The txmake utility program can be used to compute a spherical harmonic representation of an environment map. The environment map can be in lat-long or cube-map format, and the input image format can be any of the many image formats that txmake supports. The spherical harmonic coefficients are simply stored in the output image file itself (in the header or tail of the file, depending on the image format). Currently the output image has to be in OpenEXR or TIFF format. (The default value of shbands is 0, which means that no spherical harmonics are computed.) The image type has to be envlatl or envcube. At this point we have both directional visibility (at each point) and the environment map represented as spherical harmonic coefficients. Computing the environment illumination at each point can now be done by convolving the the two sets of coefficients. The advantage of the spherical harmonic representation is that convolution is simply done by a dot product of the coefficients, so it is basically just a few multiplies and adds at each shading point. Hence it is very fast! 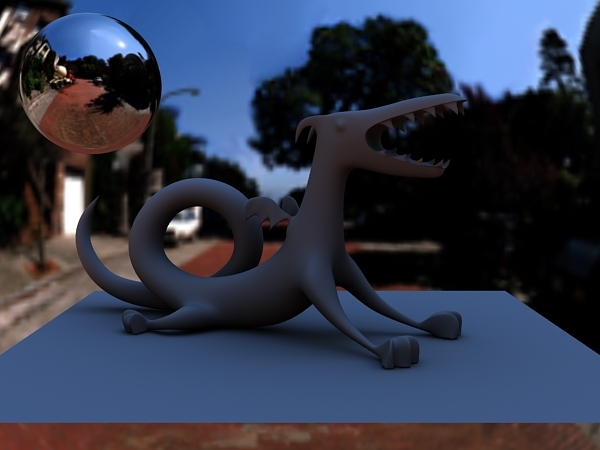 Here is a shader example that convolves the environment map's spherical harmonic (color) coefficients with the directional visibility's spherical harmonic (float) coefficients. The environment map's spherical harmonic coefficients are read using textureinfo() and then converted to the built-in data type stdrsl_SphericalHarmonic. Since the environment map is the same for all surface points, the coefficients are only read once per grid. The coefficients can optionally be rotated, corresponding to rotating the environment map. At each shading point, the directional visibility's spherical harmonic (float) coefficients are read from a point cloud using texture3d(). The coefficients are then converted to the stdrsl_SphericalHarmonic data type and convolved with the environment map coefficients using the built-in function convolve(). // map. The sum of the products is the environment map illumination. // Get environment map SH coeffs (same for entire point cloud). // number of SH coefficients in the environment map. // Lookup directional visibility SH coefficients in point cloud. // number of SH coefficients in the point cloud file. // Convolve directional visibility SH coeffs with env map SH coeffs. // The convolution is simply a dot product; the result is a color. // weighted less, resulting in reduced ringing (smaller oscillations). Notice how the illumination on the dragon and the soft shadows correspond to the environment map. There is a sphere in the upper left corner which shows a reflection of the environment map. The background of the image shows part of the same environment map, projected onto a half-sphere behind the rest of the scene. 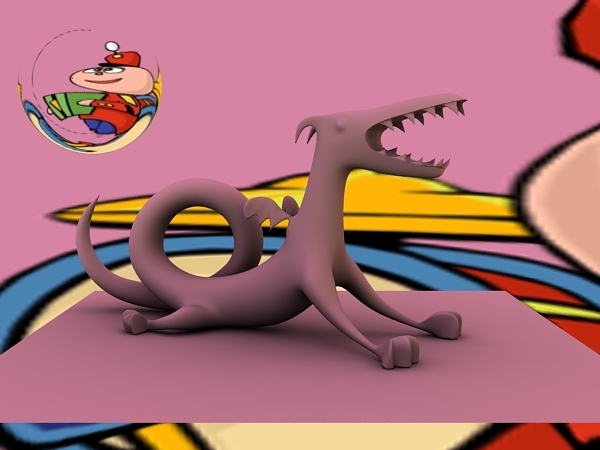 Rendering this image at 1K resolution on a modern multi-core computer only takes a few seconds. That's fast enough that rotating or changing the environment map (and recomputing its spherical harmonic coeffients) can be done interactively, and the image can be re-rendered many times until the illumination is as desired. 'Windowing' means weighting higher bands (higher frequencies) less in the convolution, resulting in reduced ringing (smaller oscillations). The convolve() function takes a windowingmode parameter for this purpose. If windowingmode is 0, no windowing is done. If windowingmode is 1 or 2, higher bands are reduced. With windowingmode 1, higher bands are reduced using the square root of a cosine. With windowingmode 2, higher bands are reduced using a function that minimizes the Laplacian. The exact formulae can be found in /stdrsl/SphericalHarmonics.h. One of the beautiful properties of spherical harmonics is that they are closed under rotation, meaning that any function that can be represented with a given number of spherical harmonic bands can be subjected to any rotation and still be fully represented with the same number of bands. Only the values of the coefficients change due to the rotation. In other words, no accuracy is lost when rotating spherical harmonics. With the rotate() function, it is simple to rotate the precomputed environment map coefficients without having to recompute them (i.e. running txmake again). # straight ahead, and left and right edges are behind. and then passing the coordinate system name "rotateLatLong" as the "envspace" shader parameter. Rotation is also handy when interactively trying out different orientations of an HDRI environment map: just change the rotation and re-render. As a step beyond environment illumination, we can also compute a spherical harmonic representation of the directional variation of the indirect illumination at each point. The first step is to generate a point cloud with area and direct illumination data. The second step is to call ptfilter with the colorbleeding filter to compute the spherical harmonics. 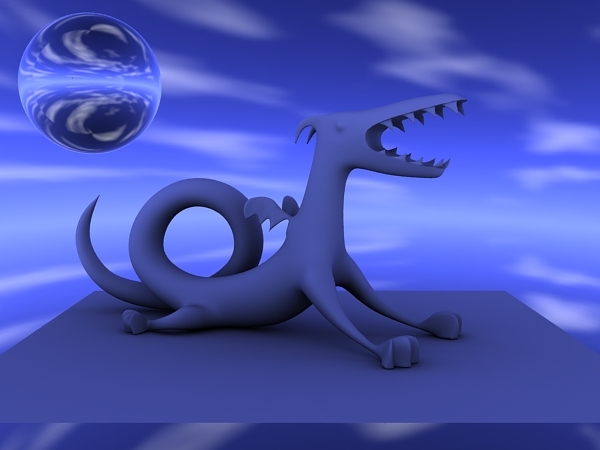 In addition to the _dirvisshcoeffs array, there is also an _incradshcoeffs array in the dragon_irrad5.ptc point cloud. The latter is a spherical harmonic representation of the incident indirect illumination at each point. The coefficients can be inspected with ptviewer. Alternatively, the indirectdiffuse() function can be used to compute the same results. Like occlusion(), the indirectdiffuse() function has a new optional parameter "shbands", and it has two optional output variables: the float dirvisshcoeffs array and color incradshcoeffs array. Image-based lighting and relighting is fast enough that it can be used as an interactive technique for designing and fine-tuning environment illumination of complex scenes. An additional use is for computing the directional variation of indirect illumination. Press, Flannery, Teukolsky and Vetterling, Numerical Recipes in C, Cambridge University Press. Francois Sillion, Jim Arvo, Steven Westin and Donald Greenberg, "A global illumination solution for general reflectance distributions", Proc. SIGGRAPH 1991, pp. 187-196. Ravi Ramamoorthi and Pat Hanrahan, "An efficient representation for irradiance maps", Proc. SIGGRAPH 2001, pp. 497-500. Peter-Pike Sloan, "Stupid spherical harmonics tricks", Microsoft tech report, 2008. Matt Pharr and Greg Humphreys, Physically Based Rendering: From Theory to Implementation, 2nd edition, Elsevier, 2010. Jacopo Pantaleoni, Luca Fascione, Martin Hill and Timo Aila, "PantaRay: Fast ray-traced occlusion caching of massive scenes", Proc. SIGGRAPH 2010, article 37.